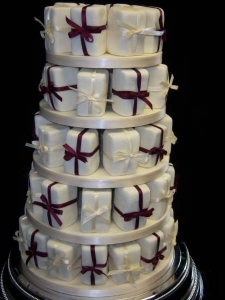 Sponge, lemon cake, chocolate cake or fruit cake completely encased in fondant icing. Each parcel is tied with ribbon and is very easy to handle, serve and even take home in a handbag! The example shown is suitable for around 50 guests (however please note that the price shown is for 80 guests) and has been finished with ivory icing.